Sonali, who is undergoing cancer treatment, shared several pictures of her quiet celebrations. While Bollywood celebrated Diwali with glittery bashes all over Mumbai, Sonali Bendre brought in the festive season with husband Goldie Behl and son Ranveer in NY. 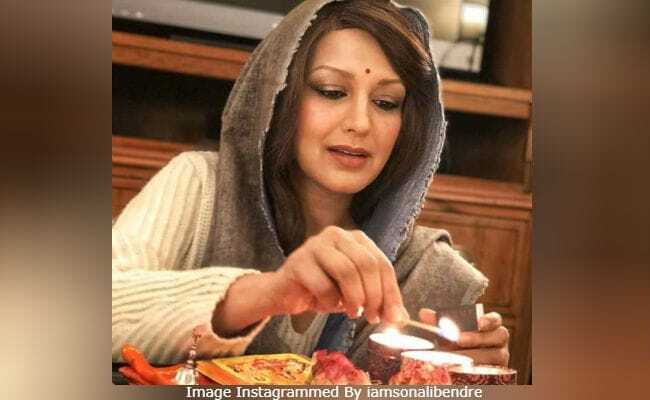 Sharing the photo on Instagram, Sonali Bendre wrote that she has wished everyone late as Diwali in NY comes later than that in India. In her words, it clarifies that she is missing all the joy from back home. She took to social media and shared that Diwali in NY happened much later than in Mumbai. Hence the late wish! She also said that it was an unconventional Diwali as they did not wear ethnic clothes and just kept a simple and small puja but it was with a pure heart.